Key findings from the 2016 ICEF i-graduate Agent Barometer were released yesterday at the ICEF Berlin Workshop. Now in its tenth year, the Agent Barometer remains the industry’s most comprehensive survey of education agents. The survey ran over September and October this year and drew responses from 1,111 agents in 108 countries. As in previous years, the respondents were widely distributed by market, with only India (12%), Brazil (7%), Nepal (5%), Canada (5%), and Russia (5%) accounting for 5% or more of the total sample. The programmes emphasised by respondents shifted slightly this year. 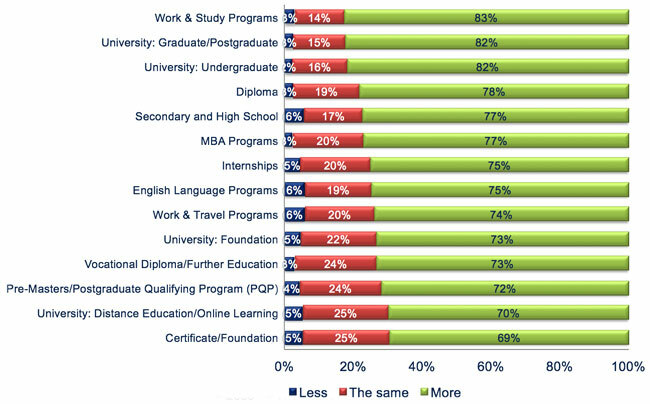 Among 2016 respondents, undergraduate programmes are the most common study category for which agents recruit (80%). This compares to the 77% who indicated they recruited undergraduate students in the 2015 survey. Close behind in 2016 were English language courses (79%), which were reported as the lead category in 2015 (80%) and have grown in prominence in the annual survey since 2014 when 70% of agents indicated they were recruiting for language studies. Three in four respondents this year also indicated that they are recruiting postgraduate students (roughly equivalent to the 74% that indicated they did so in the 2015 survey). Also on par with last year were vocational and further education programmes, with roughly half of responding agents indicating in both 2015 and 2016 that they were placing students at this level. The same was true for work and study as well as work and travel programmes, both of which held steady at 30% and 21% respectively. Online programmes inched up slightly with 22% of responding agents indicating that they are recruiting for online. This is again comparable to 2015, but up sharply from the 2014 survey when only 5% reported recruiting students in this category. All told, this year’s respondents placed nearly 210,000 students in the previous 12 months, with roughly half referring more than 100 students each during that period. This year’s agent sample also reflected a very optimistic view for the future. As the following chart reflects, most agents expect to place greater numbers of students over the next 12 months. In a reflection of the increasing role of education agents in recruiting for US institutions, the 2016 survey incorporated some targeted questions on the US market for the first time. Nearly all respondents (93%) reported representing US institutions, with roughly half indicating that they recruited for up to ten US institutions. When asked how they benefited from representing US partners, a third of responding agents said the US was the top preference of their students. Another third said that US institutions helped to diversify their portfolio of programme offerings, and 27% felt that US clients contributed to the profile and prestige of their agency. As was the case in last year’s survey, Canada and the US again topped the table as the most-attractive destinations among responding agents (when combining the percentage of respondents indicating that each destination was either “very attractive” or “attractive”). Agents report growing interest in Canada in particular due to its improved affordability (as a result of currency exchange movement) and improved access to student visas. A closer look at the numbers, however, shows that both the US and UK have lost ground in this year’s sample, in terms of the percentage of respondents that rated each destination as “very attractive”. In 2014 and 2015, 77% of responding agents rates the US as “very attractive” but this percentage slipped to 67% this year. 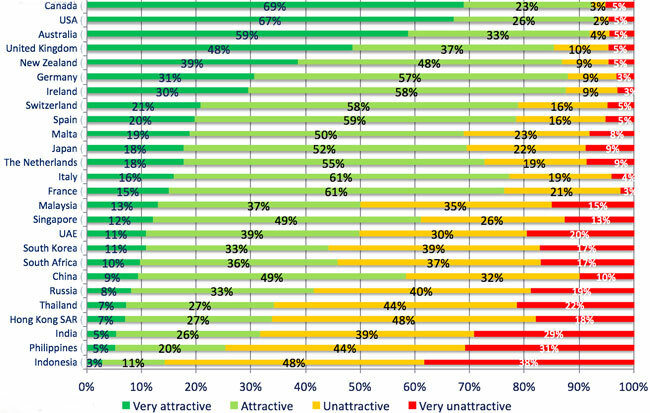 From 2012 through 2015, roughly two-thirds of respondents (63-64%) considered the UK to be very attractive, but that percentage declined nearly 20 points this year to 48%. The survey provides some insights as to the reasons behind this slippage for both of these leading destinations, and agents have largely indicated that the declining interest in both is a function of increasing cost due to currency fluctuations and/or concerns around visa processing. This reinforces that some of the challenges we have explored in earlier coverage – the presidential election, relative costs of study, safety concerns in the US and visa policy and the Brexit vote in the UK – have likely played a part in the shifting perception of both destinations on the part of this year’s agent sample. Agents continue to prioritise quick response times to inquiries and applications as the most important marketing tactic for partner-institutions this year. This was the top-rated tactic for 93% of respondents this year (the same level as in 2015 and up from 78% in 2014). The following chart illustrates the other top-rated responses, and they generally reflect a greater focus on online services as well as institution-led training and support than we have seen in previous years. As in 2015, this year’s survey also tracks student concerns (as reported by agents), and finds a general lessening of financial concerns in 2016. The following chart otherwise some important tracking of concerns over the past eight years. It illustrates that while financial concerns indeed fell off this year, student concerns with respect to study visas, the political environment, and safety all increased in 2016. As in previous years, the survey responses underscore the importance of the constants in our industry – first and foremost, strong working relationships and responsiveness. And online continues to emerge as an ever-more important channel for recruitment as well as both student and agent support. At the same time, we also see some important shifts this year, largely driven by issues of affordability, perceptions of safety, and the confidence with which agents and students expect that study visas can be secured for a given destination. This entry was posted in Africa, Agents, Asia, Australia/Oceania, Europe, Higher Education, K-12, Language Learning, Middle East, North America, Regions, Research, South & Central America, Vocational, Work Abroad and tagged undergraduate student recruitment, international students, student mobility, foundation programme, safety of students overseas.